The pasar malam at Pelangi neighborhood is another malaysian chinese dominated night market. This tuesday night market is much shorter than the one held outside KSL mall on mondays. Some of the hawkers can be seen at KSL pasar malam as well. If you have to choose one malaysian chinese theme night market in Johor, go for the KSL pasar malam for ease of accessibility & variety. Click to view bigger map. As usual, my mobile phone is switched off. Taking a break from phone addicted 'zombies' in SG. Board any bus heading to Ulu Tiram/Kota Tinggi at JB Sentral. Alight at bus-stop after T- Junction of Pelangi Plaza. Head north till you see an open field. Turn right at end of shophouses & walk through the residential area. Upon exit from residential area, you'll see 3 petrol stations & a mosque. Walk in direction of mosque to reach pasar malam. Total walking distance is around 1.1km. It is better to leave before night fall due to the walking distance. First of all I want to address the hygiene issue that was raised by commentators in previous pasar malam blogposts. As i've mentioned, eating at higher class eateries doesn't equate to better levels of hygiene. You don't know what's in the kitchen until the food is served to you. Some find that the street hawkers are unhygienic with their 'open cooking' but at least there is transparency. You see what it is like & if you don't like it you can don't patronize them. Hahaha, now i've got a frontal view of this mobile penang rojak hawker. I snapped a picture of him from the back as he is making his way to his spot at KSL pasar malam. Penang style rojak + penang registered motorcycle = authentic feel. How can johorean hawkers compete with this type of authenticity? The term for this type of edge in economics is called 'comparative advantage'. A glove on his left hand to handle food. Full blown transparency unlike a closed kitchen. How can those spam eateries in shopping malls be tourist attractions? Look at the gas cylinder at the rear of his sidecar motorcycle. He has a glove on his left hand as well like the rojak hawker. 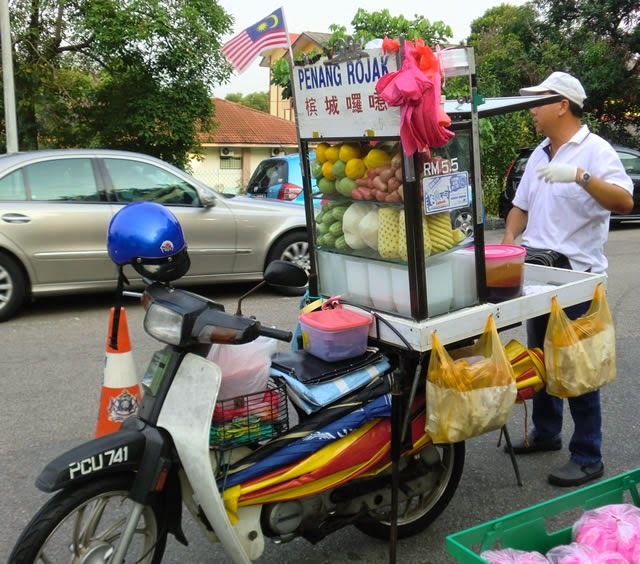 These hawkers on wheels can move around to better business locations - flexibility. Entrance to pasar malam - mosque is behind the popiah hawker operated from a van. I had 2 rolls of popiah after eating carrot cake. Would prefer the popiahs to be sweeter. As for the carrot cake, i still prefer the carrot cake hawker at KSL pasar malam. Steamed chinese buns which are normally eaten at breakfast. Malay grandparents tending to grandkid. Selling only vegies from their simple stall setup, it is likely that they reside in the countryside. Do we ever see 3 generations of a family doing business at a shopping mall in SG? 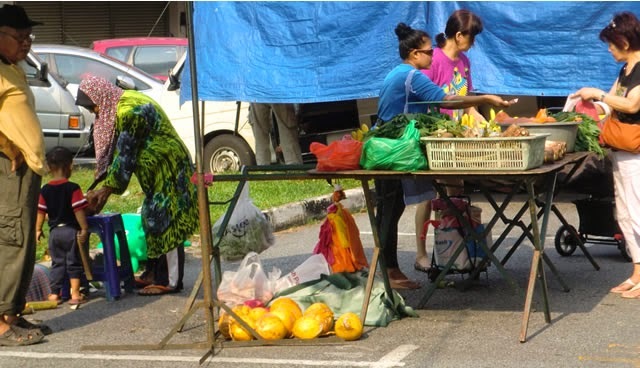 At least when buying from these hawkers, you'll know you are mostly benefiting grandparents, grandkid. In Sillypore, much of the price goes to paying a faceless landlord. Unload everything from the truck & prepare at their stall – fresh. Open air cooking. 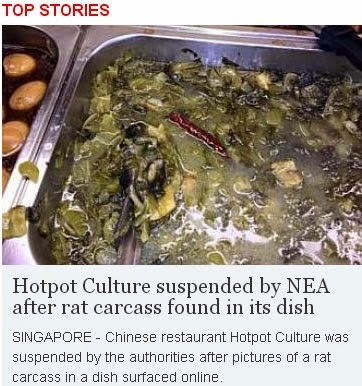 Such pictures leave a distaste on some readers in previous pasar malam writeups. Rattan chair for toddler & small table. Such artisan-made rattan furniture are practically extinct from local furniture shops. Don't see them in local pasar malams as well. [Left] Look at how the clothes hawker set up his tentage with his van inside. 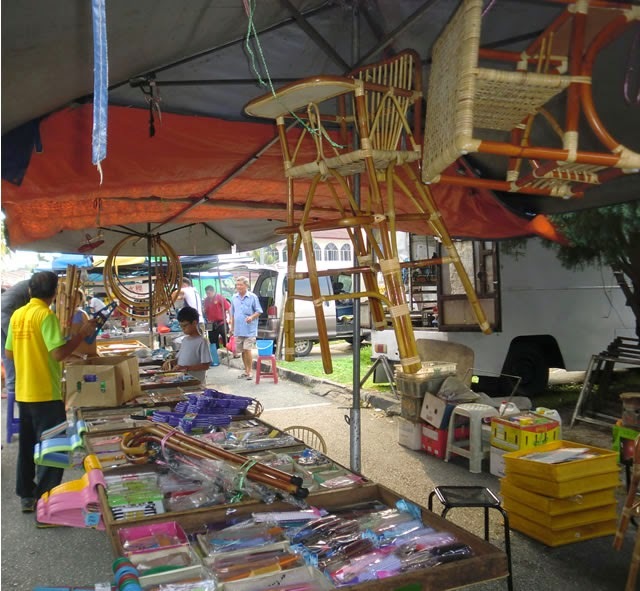 Pasar malam hawkers in Malaysia are very hands on in setting up their stalls contributing to a sense of personality for the site. 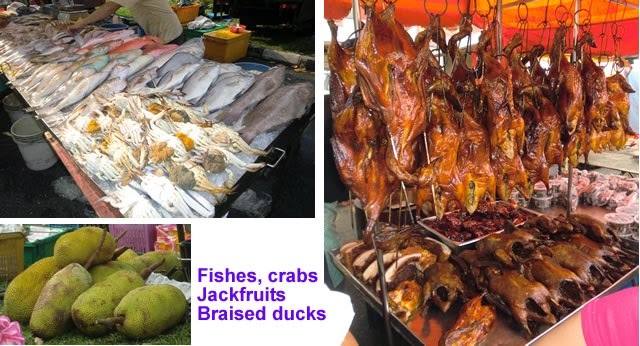 This is the 3rd pasar malam writeup on my blog. My focus is mainly on the personality of them. I don't showcase much food as this is not a food blog. 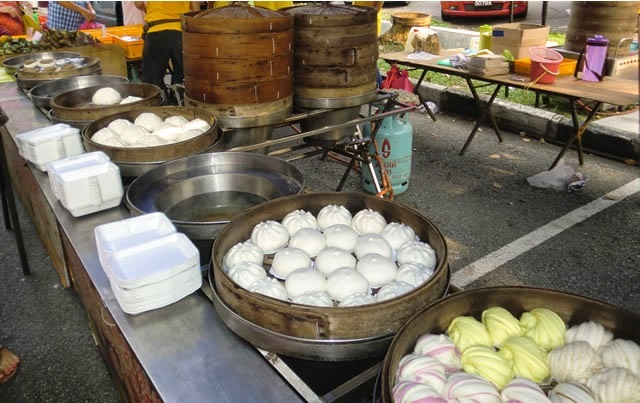 With regards to food at a pasar malam, the better approach is to eat a bit of different food(smaller servings) in order to sample more. 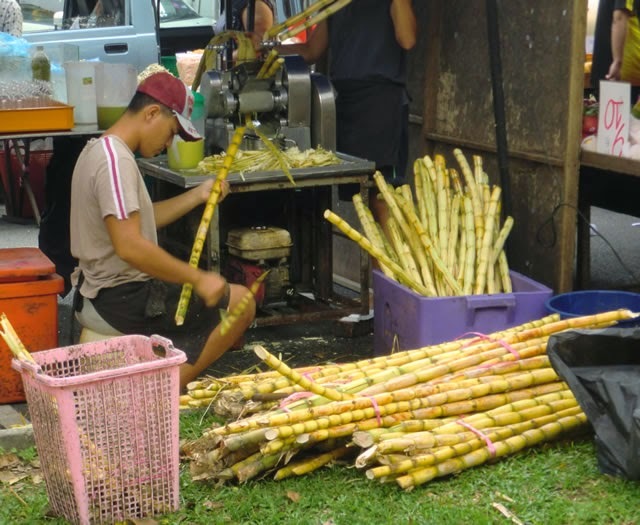 Pasar malams in Johor, Malaysia are a nice break from the cookie cutter shopping malls in SG. Is more human there with not so many zombies addicted to 'opium' aka mobile phones.